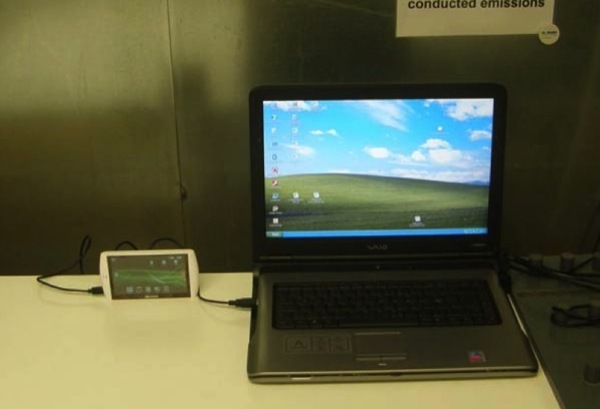 Archos' Android-based A5S and A5H Internet Tablets outed by FCC? You know those confidentiality agreements companies sign with the FCC to keep our prying eyes away? Well, Archos didn't sign one. The result is a treasure trove of information about its new A5S (model 7501) Internet Media Tablet and a whisper of the A5H (model 7502) to come. The A5S looks very much like the 4.8-inch Archos 5 we already know and uh, know. However, there is a slight redesign resulting in a new location for the speaker and headphone jack as well as the inclusion of a microSD slot and what looks to be microUSB. Given the emergence of this new model so close to Archos' Android launch event and the repeated mention of the 5-inch "Archos 5 Internet Tablet" in Archos' own Android AppsLib store, we're guessing this is the new Android device set for a September 15th announce. True, the single UI shot (pictured after the break) isn't vanilla Android (it's likely skinned a la HTC's SenseUI) but it marks a radical departure from Archos' current offering. The FCC tested 802.11b/g/n WiFi, Bluetooth 2.1+EDR, and an FM transmitter and receiver on the A5S while a user manual briefly mentions 3G data, although the FCC didn't test it. Perhaps that's the secret sauce inside of the A5H model 7502?